Waterproof phone with removable battery and micro-sd slot? It’s here! 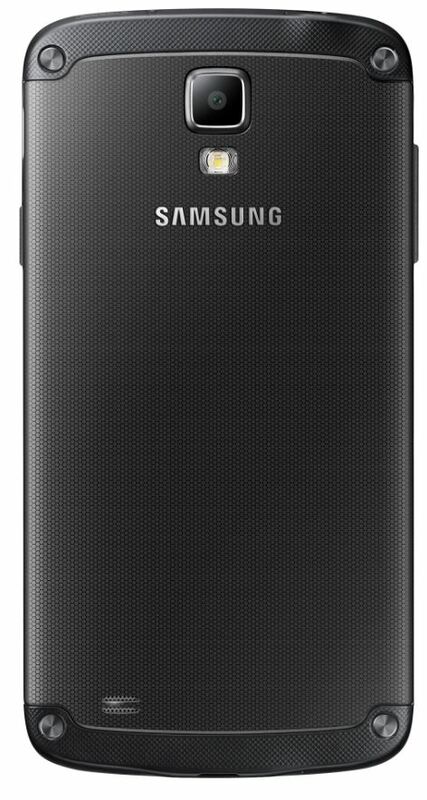 Samsung has officially introduced Galaxy S4 Active, about which we’ve been learning a lot in the past few weeks through leaked info and images. In my one of earlier posts, I had mentioned lack of waterproof capacity as GS4’s disadvantages. It appears that my rant has been addressed. Galaxy S4 active has all the goodness of GS4 regular model, but two major compromises – 8mp primary camera and TFT LCD display instead of 13mp camera and Super Amoled display as in SGS4. 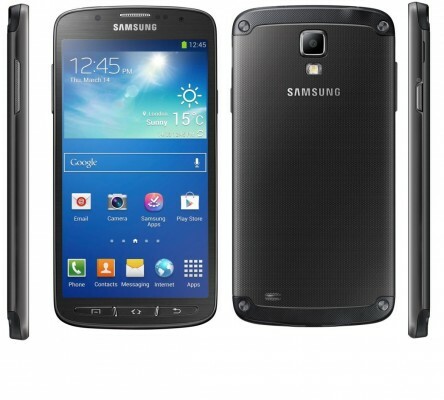 The name of this rugged version of SGS4 may seem weird but imply the sense. It’s meant for Active people. It’s meant to accompany you in your adventurous activities. Design-wise, we appreciate it! Really, it is appealing. The design fully imparts the sense of this phone being rugged and strong. The four screws at the back makes the look classic, something which I think ‘active people’ will like as they want something which not only features ruggedness, but also sports the same. The three physical buttons at the front – Menu/option, Home, Back – instead of capacitive buttons are, indeed, necessary for a phone of this niche. The physical keys ensure no accidental or unintended operation. Tapping physical buttons to operate the phone while in water is more directive and operative than capacitive buttons. The backplate is removable. It measures 139.7 x 71.3 x 9.1mm (regular sgs4 model measures 136.6 x 69.8 x 7.9 mm), so higher physical dimension in comparison to SGS4. 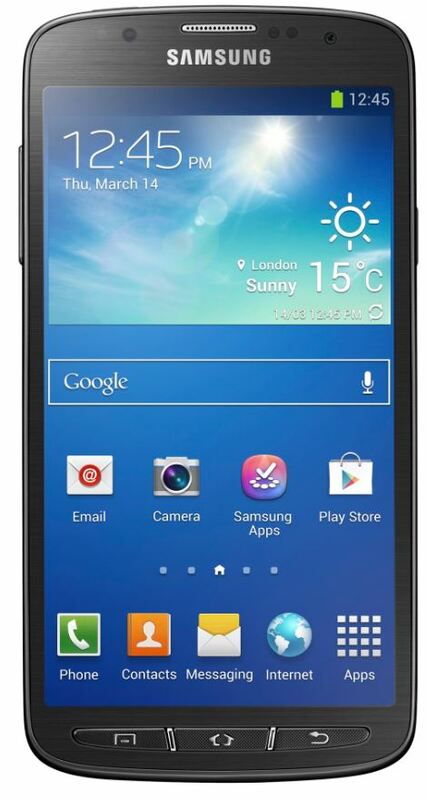 Its ruggedness has caused it to weigh about 21g more than regular sgs4. GS4 Active weighs 151 gram. It is IP67-certified, which means that this phone is fully protected against dust ingression. Moreover, it can withstand water for upto 30 minutes and under 1m of depth. You can pour water on this phone. Just wash it with clean water when dirty. It’s fun! IP67 certification is different from IP57 in terms of dust-proof capability. SGs4 Active has a little higher IP code than Xperia Z (IP57). IP67-certified devices donot allow dust entry completely, while IP57-certified devices are also dust-resistant, but may allow dust-entry in some cases, however such ingress should not harm device in any way. 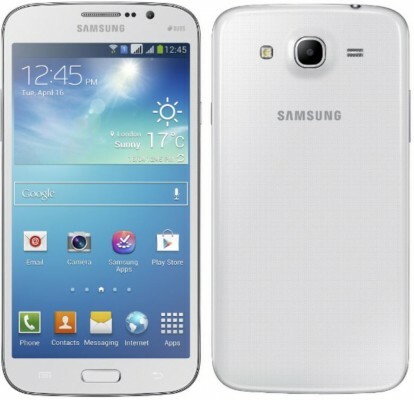 Its specifications are the same as of Galaxy S4 as mentioned earlier. The main difference is there in camera and display type. Galaxy S4 Active has the same processor i.e. Snapdragon 600 running at clockspeed of 1.9GHz with 2GB of RAM. Yeah, exynos octa processor is not there and we’ve heard of no such variant of Active. The display is of 5-inches with resolution of 1080*1920 pixels. The display of TFT LCD type. The subpixels are more in TFT LCD type display leading to more accurate colors in comparison to Amoled display, but the black levels are not that good. Internal storage capacity is 16GB, but there is micro-sd card slot as well and so the storage capacity can be expanded upto 64GB. This is one strong point of SGS4 Active over Sony Xperia Z. To provide waterproof, dustproof capabilities in Xperia Z, Sony has made the phone completely sealed and so there is non-removable battery and no micro-sd card slot in it. It has 2600mAh battery. The camera is downgraded here as S4 Active has 8 megapixel camera with flash. 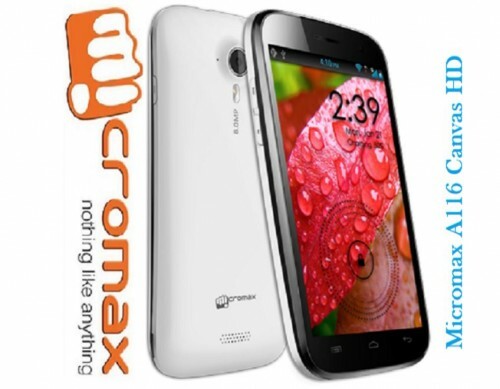 At front, it has 2mp camera. Both the cameras, front and rear, are capable of shooting 1080p full hd videos. Volume key acts as physical camera key to help users quickly capture shots. This is useful for a phone of this type. Camera has Aqua mode also, which is specially tweaked for underwater shooting. Other camera features, include, best photo, best face, drama shot, sound and shot, etc. WiFi, Bluetooth, 3G, 4G LTE, NFC – all these connectivity features are the same as in GS4. Android 4.2 Jelly Bean OS is on it. IR Transmitter is also intact and so it supports Samsung WatchOn. Other features include, Smart scroll/pause, s translator, s health, etc. Another interesting feature of SGS4 Active is the headphone jack is also waterproof so you can use it in water. You don’t need to put flap cover on headphone jack before entering water. The price of Galaxy S4 Active is not announced. It is slated to arrive in US and Sweden initially, this summer. Its release date in other countries is not yet confirmed, but it will be launched in other countries as well for certain. It is available in 3 color options -Urban Grey, Dive Blue and Orange Flare. Because of the two key downgrades in respect of camera and display, we hope for the for Galaxy S4 Active price to be little less than the regular s4. If priced right, reasonable and competitive, this phone may beat Xperia Z in terms of sales. Galaxy S4 Active release date in India is also not confirmed, but we’ll know more about its release schedule in other markets soon at Samsung Premiere Event on 20th June in London. Stay tuned! Your opinions in comments!